Successfully Added Zidoo V5 Wireless Air Mouse - 3 Axis Gyroscope, Accelerometer, 2.4G Adapter, QWERTY Keyboard, Mic, Air Mouse to your Shopping Cart. The Zidoo V5 is a wireless keyboard for use with TV boxes as well as Mac and Windows computers. Coming with a 2.4G adapter you simply plug it in and your ready to go, it's quick and easy with no pairing required. A full QWERTY keyboard on one side and a host of shortcuts and navigation keys on the other makes this controller the perfect solution for surfing the web as well as responding to emails, typing notes or just browsing channels on your media player. The ergonomic design and layout of the keys ensure if feels great in the hand and is easy to use. The slim design also makes it exceptionally portable. With precision highly accurate sensor and 3 axis gyroscope and accelerometer, the V5 remote is your mouse as well as a keyboard. You can move the remote to control the cursor on your screen which is easier and faster than using a mouse and doesn't require a smooth flat surface. The Zidoo V5 remote also features a built-in microphone that has noise cancellation so you can use it with voiced based services like Google assistant or chatting apps. A built-in rechargeable 500mAh battery brings plenty of usage times. 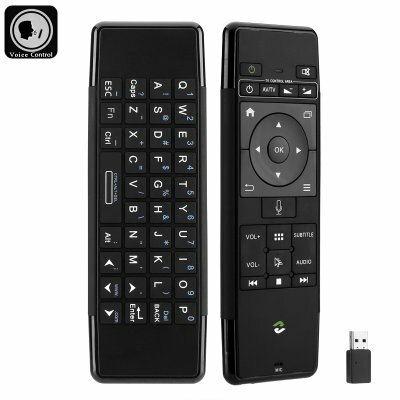 The Zidoo V5 Wireless remote comes with 12 months warranty, brought to you by the leader in electronic devices as well as wholesale Android TV Boxes and accessories..